Most women have body hair somewhere that we would rather be without. 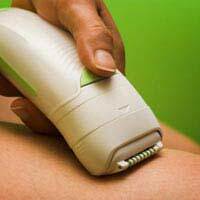 Choosing a method of body hair removal that is effective, not too expensive and not too time consuming depends on personal preference and also which part of the body you want to keep hair free. For women, the simplest and quickest way to remove hair from the underarms and legs is by shaving. Razors, either the simple type used to wet shave in the shower, or electric razors are available in designs that have been produced with women in mind. Shaving removes the hair at the surface of the skin by making a clean cut through it, leaving the skin clear and hair free. Shaving can be repeated often - every day if you want - but it doesn’t remove hair for more than a few days. After shaving, hair that grows back tends to appear coarser, firstly because the end is blunt after being cut, and secondly because all of the hairs that grow back are more or less the same length. An alternative to shaving is to use depilatory creams, wax or an epilator. These can all be used at home and take only a little longer to do than saving. After spreading the depilatory cream over the skin for a few minutes, it is then scraped off using a tool provided with the cream. The hair is removed chemically from the root, which means that the skin stays hair free for longer - up to two weeks - but the skin can suffer reactions to the chemicals in the cream. Epilation and waxing produce very similar results but use different techniques. Both remove each hair from the root, so the skin feels very smooth afterwards and repeat treatments are not usually needed for two to three weeks. Hair growth tends to get weaker with repeated treatments, but regrowth can vary in skin in different parts of the body, and between individual women. Hot wax is spread on the skin and then a cloth is placed over the waxed area, pressed firmly, and the ripped off the skin, bringing the wax and hair with it. Some people do find waxing painful, and this is worse when the hair is first waxed. Epilators also pull the hair out by the roots, but do so by hooking individual hairs out as the epilator is moved over the skin. Epilation can also be uncomfortable but modern, wet and dry epilators can be used in the bath or shower with plenty of soap and foam, which helps to minimise this. None of the above methods should really be used on facial hair in women, apart from perhaps waxing, which can be done on the eyebrows by a trained beautician. Using tweezers and trimmers to pluck out individual hairs, from the eyebrows and above the top lip can work well, but this does need commitment, particularly if you have thick eyebrows and want to change their shape significantly. Facial hair can be the most embarrassing type of unwanted body hair in women - for men it is normal to shave and have obvious regrowth but most women want to keep facial hair hidden. A permanent solution can be to have professional electrolysis or laser treatment. These both kill the follicle from which an individual hair grows, removing it forever. Treatment has to be done in stages, but several sessions on a top lip will usually sort out the problem for good. Laser treatment is more of a recent development in hair removal and this uses strong laser light to destroy the follicle. It is possible to have laser treatment on larger areas of skin, and many women are pleased with the results. It is only available privately, however, and this sort of hair removal treatment can become very expensive.